How to get rid of cellulite - all answers here! Cellulite myth - Only fat girls have it??!! Cellulite myth - Men don't have cellulite? Kim Kardashian has cellulite - so what?! OK, except the inner beauty (and you are beautiful), when outer beauty is considered, cellulite is really a minor problem. You just have to learn how to accept it and how to carry it with grace. This article is here to help you accept your cellulite. If Kim Kardashian, model under constant spotlight, can accept her cellulite, and simply say (I'll paraphrase) - I don't mind cellulite, I like my curves - why couldn't you??! Love your body, use it best as you can, dance, walk, swim, run, ride a bike, make love. :) Learn what is beautiful about your body, be proud of it. Confidence is the key. There are many possible reasons for cellulite to appear. Besides the inherited affinity to accumulating cellulite, our habits play a huge role. What we do, eat, and even how we feel, may have affect. There are some food that might be helpful for getting rid of cellulite, but it's also useful to know what food you should avoid to prevent cellulite. For the detox part, on one hand you have to reduce the input of said food, and on the other hand, you should try implementing as much fruit, vegetables, unrefined and even raw food. Especially good for detox are teas (like green tea), but don't add sugar, use honey instead. Also, juiced fruit like grapefruit, oranges and lemons, (or all of them together!) are really great. This is just one example, you could try many variations. Also, remember - it is "detox day" - after one day of detoxification you should continue with a normal diet. Could pregnancy induce more cellulite? Well, you'll surely gain some weight - that should not worry you; 80% of that newly gained weight you'll lose in the first few months after the birth. The good news is, you have no reason to think that you'll be more prone to cellulite during pregnancy than in any other period of your life. However, pregnant or not, cellulite is something that is easier to prevent and cure. While pregnant, many diverse methods of getting rid of cellulite can not work for you - you can not go on a diet, use any kind of "magical" pills (which I would not recommend anyway), go to arduous treatments, etc. 1. Walk. If there is no complication with your pregnancy, or not advised by your doctor otherwise, walking is a good way of preventing and reducing cellulite. It's recommended to walk for at least half an hour a day, but if you have enough time, even 2 or 3 hours a day would be great. 2. Massage. This specially goes for those areas already affected with cellulite. 3. Relax & enjoy. It's seriously considered that one causes of cellulite is stress. Pregnancy might be stressful for some, so try to enjoy in good sides of it. For relaxation you might use some steamy baths with salts, oils and essential oils like lavender, orange, grapefruit, rosewood, ... . Here you can check the list of home made cellulite remedies! 4. Eat lots of fruits and vegetables. They contain necessary vitamins and minerals, as well as dietary fibers. Some of the best fruits for preventing cellulite are grapes, banana and pineapple. 5. Drink lots of water, unsweetened tea, juiced fruit like orange, grapefruit, yogurt. These might sound a bit simplistic, but the hard part is making it all a habit. Simply said, there is no miracle, sophisticated, complicated way of preventing and getting rid of cellulite, but simply doing your best to adopt these habits as much as possible. Most of us try keeping our towels soft and fluffy. We use fabric conditioners, hot dry them, add Calgon tablets, add vinegar and so on. But, have you ever thought that you would actually benefit more with rough towels, than soft ones? The massage you get is very useful, and what is even more important you will get a massage of your whole body, each and every day. Massaging really helps getting rid of cellulite, and the most important thing is to do it regularly. Using rough instead soft towels is a cheap, simple and effective way to remove cellulite and have beautiful legs. Sounds like a miracle, joke or just bs, doesn't it? 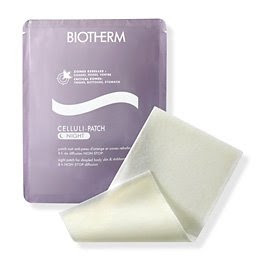 Well, Biotherm Celluli Night Patch is a new cellulite treatment that promises results in just 10 nights - yes, you understood well - it is supposed to work while you sleep! Celluli Night, an overnight treatment for the reduction of visible cellulite areas, works specifically in synchronization with the body’s biological clock. The body awakens progressively. Drainage processes are facilitated. The body is fully active. Fat-burning enzymes are working to transform food into energy. The body begins to tire and expends less effort. It is storing energy for later. More of what is consumed is transformed into fat. It is storing energy for later. Celluli Laser Night should be applied to the affected areas in the evening. For additional benefits Celluli Laser Day is also available.